While in the area and with some time to spare, here are some suggestions for things to do and places to visit without having to drive for more than 30 minutes. The obvious is to spend an hour on Loch Ness on board the Royal Scot or for a more exhilarating trip book a cruise on one of the rigid inflatable boats – great for blowing away the cobwebs! If you really fancy getting away from it all, the south side of Loch Ness (B862) offers spectacular open spaces and forests which are home to red deer, roe deer, badgers and pine marten and even red squirrels. For bird watchers, look out for ospreys, red kite, grouse and golden eagles. The area has many designated walks one of which takes you to the spectacular Falls of Foyers. 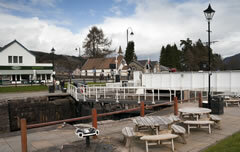 Back in Fort Augustus walks are also aplenty. We have the Great Glen Way (a long distance walking route which cuts across Scotland from Fort William to Inverness, a distance of 79 miles). Feel free to do as much (or as little!) of it as you like, either on foot or bicycle. Cycles can be hired from Morag’s Lodge just down the road from Thistle Dubh. Other local walks take you into the forest or down by the river, just ask for information on those during your visit. For golfers, there are the delights of a nine hole golf course (reputedly the most challenging nine hole course in Scotland) where you can hire clubs should you have forgotten, did not want to or were not allowed to bring your own! The local Visitor Information Centre also hands out leaflets and advice to help you decide how to make the most of your time here. If you are lucky enough to find yourselves staying in Fort Augustus on any Wednesday night from mid July to the end of August you will not want to miss the ceilidh in the village hall. Bring your dancing shoes! Get in touch via phone or email today and book your stay at Thistle Dubh. Take a closer look at the accommodation and find out more about our rooms and rates. Let us make some suggestions for things to do and places to visit that are close by.